Purchase your Nitro Circus tickets here at Ticket Galaxy to see some of the high-adrenaline motorsport acts in person! Nitro Circus is a combination for high-energy, intense actions sports entertainment founded by Travis Pastrana, Jeremy Rawle, and Gregg Godfrey in 2003. The action sports group created DVDs and partnered with MTV in 2009 to create a hit TV series regarding NItro Circus. The entertainment act gained major popularity from MTV's exposure and has gone on to be a global success. In 2010, the show turned into a tour with Nitro Circus Live. Since then, the tour has covered 5 continents to become the World's Most Successful Action Sports Touring Brand. 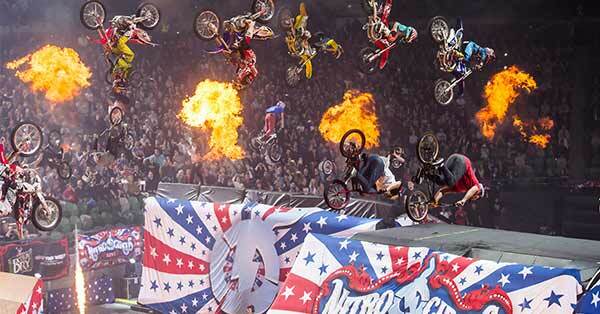 Purchase your Nitro Circus tickets here at Ticket Galaxy to see all of the action live! Nitro Circus Ticket Holders Terms & Conditions.